In medieval times, monks spent years translating and reproducing texts for church libraries, and they often embellished their script with ""gilded patterns or designs,"" giving birth to the art of illumination. This kit offers a brief history of the process, which began in the ninth century, and includes the basic materials one would need to get started: a brush, a calligraphy pen, inks, paper and paint. 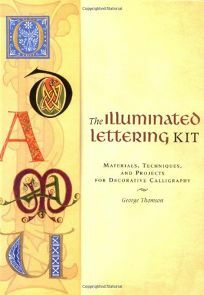 The book guides aspiring illuminators through calligraphy exercises and details four simple projects (a bookmark, a greeting card, a gift box and a frame decorated with lettering) that are nicely complemented by example photos and templates. Those who enjoy making personalized, artistic gifts may find this technique a nice addition to their repertoire, but the guide doesn't deliver much beyond the basics.